Why do fairytales continue to fascinate? Why do we think of Red Riding Hood when we find ourselves alone in the woods or even a city park? Why does Hollywood still reap profit from retelling the old stories? Why do they move us so deeply? 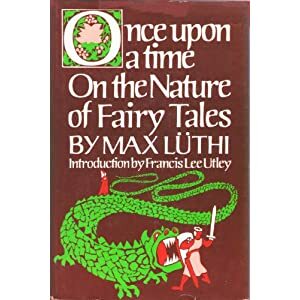 On the Nature of Fairy Tales by Max Luthi (1909-1991) is a wonderful place to begin to look under the surface of these deceptively simple tales. The eleven essays gathered in this book explore different features of fairytales such as structure, symbolism, and meaning. Luthi views the tales as a unique literary genre. He knew and referred to the major schools of folklore research – the sociological, the psychological, and the comparative historical approaches – but he always returned to the stories themselves. The meanings he found there were more than enough. At its core, the fairytale is about our “deliverance from an unauthentic existence and [the] commencement of a true one.” Prince or princess, goose girl or goatherd, all have lost their way. Their radiance, which is our radiance, is hidden. The kitchen lad wears a hat to hide his golden hair. Sometimes the hero or heroine sets off into the forest alone. Sometimes they sit and weep. “Crying, the sign of helplessness, summons assistance – again a feature recurring in innumerable fairy tales. Precisely as an outcast can man hope to find help.” The caveat is that one must be kind and compassionate to all living creatures in order to find the right kind of help at the right time. Even ants will repay a kindness that can save the hero’s life. Luthi quotes Mircea Eliade who said that fairytale listeners experience an “initiation in the sphere of imagination.” In Luthi’s view, fairytales echo the truths of the great spiritual traditions – both we and the world are far more than what we seem. This entry was posted in Authors, Book Reviews, Books, Folklore, Psychology and tagged book reviews, books, Fairytales, folklore, Max Luthi, Psychology, spirituality, stories. Bookmark the permalink. Perhaps what makes fairytales so appealing is that they zero in on the fear in our hearts and we can deal with them in a story or a familiar figure who has successfully dealt with fear. I think that’s exactly right. In several places in the book, Luthi mentioned the importance of this for kids, and insisted it’s a mistake to try to “clean up” the old stories for younger audiences. They already know the world is dangerous and will that much more inspired to see story heroes and heroines overcome it. I like that criterion for a fairytale, that it offers “deliverance from an unauthentic existence and [the] commencement of a true one”. I see much fantasy in fiction as following this precept; and don’t most of us have a private script for our lives that matches this? Look forward to your follow-up! You can see why some pedagogues dismiss fairytales as unrealistic fantasies when all that some individuals look forward to is a rags-to-riches script, a seeking-one’s-fortune scenario where they win the lottery, or a happy-ever-after ending to boy-meets-girl or whatever. But most fairytales using these and similar tropes also include personal effort or suffering as steps to attaining that happy ending, along with the necessary compassion and trust that you mention. Conveniently (or inconveniently) many wannabe celebs ignore the intermediate stages in their quest for success.